If you have an iPhone, it’s annoying hard to record phone conversations these days. In Apple’s defence, that would be because it’s illegal﻿ to record someone without their consent in many places and, let’s face it, expecting users to know what the law is everywhere is pretty unlikely. Still, I had the case where I needed to record someone’s phone conversation, with their consent, for an article I was working on. And while I thought of a bunch of solutions like Audacity and Skype, I hit a wall when they said they could only﻿ use the phone. Well now it’s on to a hardware solution. an iPhone/headphone adapter – I recommend one that allows you to use a power adapter while you’re on the phone. In case the call goes long. a male/male mono stereo cable that can convert 3.5mm to 1/4″ – Alternatively you can get a 3.5mm cable and a 1/4″ adapter. a decent XLR microphone – I prefer a lav mic (the kind you clip on) but if you want a handheld, go for it. headphones – You probably have these already. The regular 3.5mm ones. a recorder like a Zoom H4n or a Tascam DR-40 – It must have at least four input channels. The ones that have ‘two’ channels don’t allow you to plug in the phone or mic. There’s no software needed here, because that recorder saves to an SD card, so you’re going to be able to use that directly. I do recommend a power adapter for your recorder, as the XLR mic will be using power from the recorder and you don’t want it crapping out. When someone calls, I answer, make sure they’re okay with being recorded, and off I go. There are a couple things to keep an eye on that will﻿ trip you up. First of all, you must﻿ use a mono cable from your phone to the recorder. Stereo will make a weird buzzing sound. 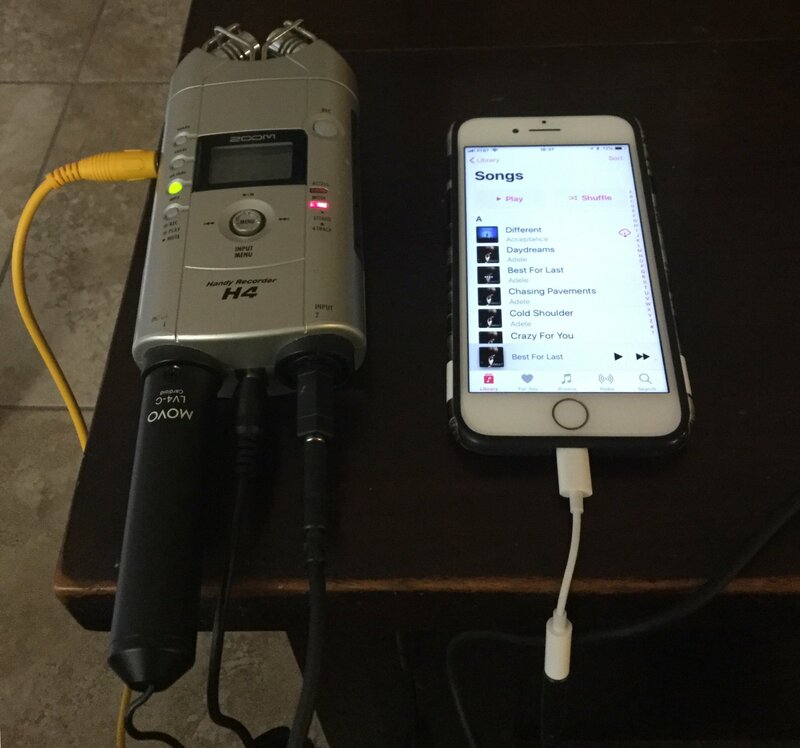 Next, I recommend plugging in everything (including the recorder) because the XLR mic uses phantom power. Make sure you set up your recorder to use input 1/2 as your input. By default, mine is set to ‘mic’ which is the two channel microphone on the top of the recorder. Using that won’t do you any good at all. And finally? Even if you live in a one-side-consent state (all US states except 12 have this, which includes my current of California so yes, I have to ask for consent first), please please please remember to ask the person before you press record.